A group of 30 Bermuda soldiers will fly out tomorrow [Sept 15] to provide help to islands in the Caribbean that were devastated by Hurricane Irma. The soldiers will leave the island in an RAF Hercules transporter and fly direct to Providenciales in Turks & Caicos, then on to Grand Turk to begin relief efforts. Tons of emergency supplies, equipment and vehicles will follow in a separate RAF transport scheduled to leave Bermuda for Grand Turk on Saturday. RBR Adjutant Captain Duncan Simons said the RBR group would include disaster recovery experts from the Regiment’s in-house engineers, Guns and Assault Pioneers, as well as soldiers trained as Special Constables and personnel with specialist construction skills. The RBR contingent will also include trained chainsaw operators and first aid specialists. Captain Simons added: “It is testament to the organisational skills of the RBR that we are packed and ready to go at such short notice. 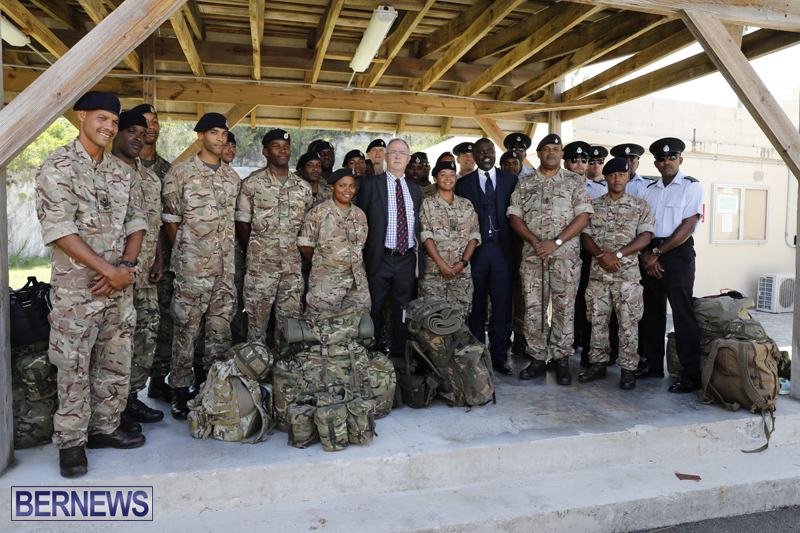 The Bermuda troops will work alongside 24 Commando Engineer Regiment, soldiers from the British Army’s Royal Engineers attached to the elite Royal Marines’ 3 Commando Brigade, as part of Britain’s Operation Ruman humanitarian aid effort. For those that are pro independence note the following from the British foreign secretary. none of this happens if we are independent, no aid, no reconstruction crews, no realistic backstop to control law and order, out on our own. Antigua sorted out Barbuda far quicker than the UK did for Anguilla, TCI and BVI, so this particular issue isn’t showing the UK’s capability for restoration in a good light if you’re arguing to ‘stay with the crown’. Rubbish………They evacuated Barbuda because it was in uninhabitable. Like no one on the islands……hello? Does a certain person own property in T and C? Remember those for independence claim we do not need any outside help. We can take of ourselves. Can you imagine the state of this island if we go independent. We will definitely be Jamaicas sister island then. Yep, to cut the aprom strings would doom us all. Hurricane response readiness is not the factor that you should use when discussing independence. Both Bahamas and Antigua and Barbuda did well for themselves in prep for and after Irma. Want to talk about stability for IB, avoiding the need for a larger defense department, avoiding having to set up overseas embassies, not needing a Central Bank and the like? Certainly those are good reasons to stay with status quo. But when it comes to hurricane readiness, the independent CARICOM nations have done ok. Certainly no worse than their British OT equivalents. Leave the Jamaica scaremongering out of it. No scaremongering…….any thought of independence in down right irresponsible, period!